Once again, Easter V:TES happened. Then, Thursday night played Shadowfist, where two of the local players played with the current owner of Shadowfist. But, what you really want to hear about is my experiences recently with solitaire play. So, let’s dwell on that for a while. Flower Garden Solitaire. Deal six columns of six cards and can use the rest of the cards to build up from aces to kings. This was terrible. Barring a lucky tableau, I fail to see how it’s possible to win and decisions are, therefore, largely meaningless. I hate solitaire games that are hard to win and where decisions don’t tend to matter. Eight Off Solitaire. Deal eight columns (have no idea why the book’s author keeps talking about rows when dealing out cards in columns) of six cards, remaining four are in a card pool. Build up from aces to kings where you can move cards from the tableau to your pool as long as you don’t have more than eight cards in your pool. This was interesting. Then, I realized it was way too easy. Then, I tried six columns of eight and found that too hard. Then, because I’m full of geniusness, I went 7×7 with a 7 card pool. I give you 77-7, the latest solitaire game in no way created by anyone else and totally unlike any game someone may call Seven Off Solitaire. It’s still kind of easy, but, then, so is the best solitaire game I’ve ever played (if you care about a game of skill that has a binary result of win/lose, unlike my solitaire bridge game which I play more often at airports). While there’s a luck component to be sure, that’s true of all solitaire card games otherwise they would be pointless. What I have been liking, before I get bored with it, is that there appear to be key decisions to be made at certain points. Actually, it’s probably similar to FreeCell only this game doesn’t have a 99.99% win rate as FreeCell has. It’s not entirely intuitive, but neither are other solitaire games. Once you get that you don’t want long chains and have to build up from aces ASAP to clear tableau chains, get the gist of it. When to clear a column to place a king is what I’m working on, while the possibility of replacing a king with another king in a column was an “a ha” moment for one sweet, sweet victory. Played two games as we only had four and someone had to go around 2PM. I lent Rob a deck with prevent. In our fights, not a whole lot happened. In Shambler fights, he got beaten down a lot. I held on to Horseshoes a lot as I don’t philosophically understand rush decks or pseudo rush decks. Brandon went from in trouble to sweeping. Rob got wrecked by Brandon. Brandon constantly intercepted both of us, but I generally avoided a lot of flak through the power of Blood Rage, maneuver, Read Intentions, Rego. Thucimia kept bleeding and Rob couldn’t really defend given that he lacked a ready minion with AUS. A My Enemy’s Enemy came my way, which would have ousted me, I bounced to Brandon, who could have DI2ed it but didn’t. He Rat’s Warninged only to have that DIed by Rob for the kill. Then, Devin bled us out. My deck amused me. Standard plan of getting Sasha Vykos Advanced out and getting a Veneficorum Artum Sanguis. Then, bring out Forestal and have him get a Vicissitude skill card. Then, finally bring out Quira, who takes the VAS and gets two Vicissitude skills. Now, it was typical in that I had zero offense for the first hour or so as I was busy tooling up and getting blocked by my predator. Looks much the same at Gen Con. So, we have six because, of course, we are a group who still actually plays Shadowfist. Rather than the much talked about possibilities for a six player game, we do three-player games. Because gaming, like sports, isn’t predictable, Daniel, Joren, and Earl played one 2.5 hour game where Earl won because the other two decked. Earl played a mostly Lotus deck with Monarchs, Daniel played Monarchs, and Joren borrowed Daniel’s monkey deck because monkeys don’t fly in our meta. Meanwhile, Don, Justin, and I played 3.5 games. The last game I wasn’t paying a lot of attention to because of time and so my Accupressure Masters didn’t really do a whole lot by the time we had to pack up with Justin winning. Amazingly enough, when you don’t defend them with Hand counterspells, they are kind of terrible. The game before that, I won off of Blossoms of the Black Lotus that didn’t get murdered like they often do. The game before that, Justin won with cops because Don didn’t have another Nuked in hand after playing two earlier in the game. I had four Cobra Clan Stalkers in play and was going to play a fifth before one got Imprisoned and I ran out of turns. Don’s Project Apocalypse almost got stolen for the win with Locksley Station!! That was when Nukeds happened. We smoked it after that bid for victory failed. In our first game, it was quick and lame as Justin kept putting out FSSs and made some lame bid for victory we couldn’t stop, as I was playing an Architect/Syndicate ambush deck where Don attacked right instead of left at a certain point, softening up one of my two Moebius Gardens to make any sort of damage enough. I showed the Prince and Earl our actual Traveller product, as Earl hadn’t seen real product. I probably should mention that they played standard Shadowfist, while we played all of our usual house rules. What is the point of this point? OKA, why did I start off with solitaire, when only ancient dinosaurs born in the 20th century, like myself, even touch decks of normal playing cards? Rules changes. They aren’t always a bad thing. Sure, you eschew house rules for tournament CCGs because you want to play the game that’s going to see play when groupies are on the line. But, I’m the only one who competes (and succeeds) at becoming the Champion of the Six Largest Economy in the World at Shadowfist out of our weekly group. Shadowfist is perfectly fine to me played straight. I think it’s more fun, on average, played with at least one of our house rules. 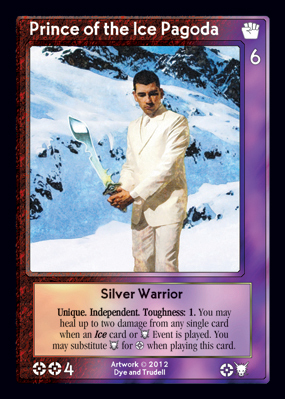 Shadowfist is a dual resource requirement game where players can end up doing nothing and never get into the game. With our house rules, that’s really hard. Now, we don’t abuse them. Sure, you probably could just win off of superleap constantly with some events because there are so many sites to attack and it’s so easy to just run out a site whenever you want to make a bid for victory. Plus, I’ve considered that our high power games could have decks built where there are far more hitters and less other stuff because you could consistently get them out. In 20+ years of playing V:TES, I’ve played under a variety of house rules, as I’ve mentioned. I’ve also played a variety of variants, including all of the meaningful storyline events, including Prophecies of Gehenna. I’ve enjoyed variant V:TES, routinely not any less than straight V:TES. I didn’t care that I needed to build 4cl decks for Pleasanton or couldn’t play normal vote decks in what I can only think to call the Bertram Group without expecting a rain of pain. I already play house rules on deck construction in every European Championship I’ve ever played in with my extensive personal banned list. And, I’ll do the same in the North American Championships coming up. I’ll try Prehensile Tail, Ancilla Antics, Distinct Directive, or all sorts of other formats. And, maybe, one of those formats is a better game. Actually, maybe just Jyhad is a better game for some because it’s faster, more streamlined, and more action focused with a lower potential power level but a much higher power level than my usual casual play. Sure, Battle For Earth, the Babylon 5 CCG format we only played to get promo cards was crap. But, hey, CCGs are complicated and messing with the rules is even more complicated with all sorts of unintended effects, so the only way you figure out what’s fun and what isn’t is to play … a lot. I was asked what it would be called, and I think “544” is good enough, though 544 Flaming Falcon came to mind. This is a joke nobody could possibly get. It involves the Q Manual from the James Bond 007 RPG, the entry for the Ferrari 512 Berlinetta Boxer, and how I wanted something with better stats. Thus was born the Ferrari 540 Flaming Falcon. Anyway, 544 refers to the maximum number of points that can be achieved in the game. I’ve really become a fan of the philosophy that restrictions breed creativity. The restriction here was that the airplane tray is small, too small for a number of solitaire games I play or even dealing poker hands. I needed something that took up a minimal amount of space while doing something new and different, as I wasn’t in the mood for a bunch of solitaire bridge. Also, too many solitaire games either have the problem of obvious decisions or no decisions. For instance, if you play Microsoft’s solitaire game, a tableau may have no decisions. In contrast, while FreeCell is solvable if you spend enough time studying the tableau, that’s boring and it’s interesting enough to just start moving cards around. Actually, I suppose I could say I hate Spider Solitaire because the decisions are undermined so by the randomness. Shuffle the deck. Draw 5 cards. Each turn, until the last, draw a card, reveal a card, and either try to match the revealed card or bury it. You can match the card in one of two ways. You can either match it on suit, in which case it goes into one scoring pile, or you can match it on its numerical value, where it goes in another scoring pile (I did numerical matches face up and suit matches face down in one pile to save space). You continue to do this until you get down to one card in the draw pile, which you reveal rather than draw. You may match cards in your hand based on value or suit, burying any that you don’t match. Cards have values equal to their face value, with aces being one and jacks, queens, kings being 11, 12, and 13, respectively. Cards matched by value are worth 10 points each, regardless as to their face value, so 20 points for a pair. Cards matched by suit are worth their face values. Cards buried subtract by their face values. The total number of points available is 544. The total number of points if matching all cards by value is, of course, 520. The total number matched by suit is only 364. Based on a number of plays, it seems that 400+ points is a good score. My high is 446. My second and third high scores are 444 and 440. There’s nothing terribly complicated about the strategy. The point of solitaire games is not to agonize and create paralysis by analysis problems but to eat up time that is otherwise mindnumbing while feeling some sense of accomplishment. Well, I like having some sense of accomplishment, which is why I rarely play games where you just run on autopilot. Yes, there’s a luck factor, that’s not a problem to me. You will likely lose some cards early, before your hand gets huge. The decisions early on about how to match on suit are the most agonizing, however, there’s an element of how to play the hand at the end when you have a wealth of options. Memory can play a part, if you care enough about maximizing score. I’m not big on memory challenges in games, but I find that it’s a low hurdle for this. If I seem vague about how to maximize scores, I think it’s worth allowing people to discover a bit on their own. I definitely got better at the game as I thought through what should be done. It’s easy enough to vary: change hand size, change value matching points (down, up would be less interesting, methinks, increasing the luck factor, though I think there’s an optimal point and 10/20 seems like it might be about it), etc.